China’s Fujian Province is the historic home of many styles of excellent Jasmine tea. Jasmine Pearls (Dragon Pearls, Downy Pearls, etc.) have become quite the rage in the West, owing to their pleasing shape and the way that they ‘dance in the water‘ as they unfurl their leaves and release a fine fragrance of enticing jasmine perfume. Pearls represent wisdom and are auspicious in China. Most often pearls are depicted as giant pearls in the mouths of dragons and Chinese guard or Fu dogs. Pearl-shaped tea is also highly-regarded for producing a tantalizing beverage as the shape works for holding flavor and aroma within processed tea leaves. Pearls in tea lore brings much goodwill to the serving table and suggests strength and benevolence for both the host and guest. The highest quality Jasmine teas, such as those sold by Tea Trekker, are made using fresh jasmine flower-buds that bloom from late August through September. Jasmine teas are seasonal teas and are ready for sale some time after October of the year in which they are made and then for 12-18 months after that. 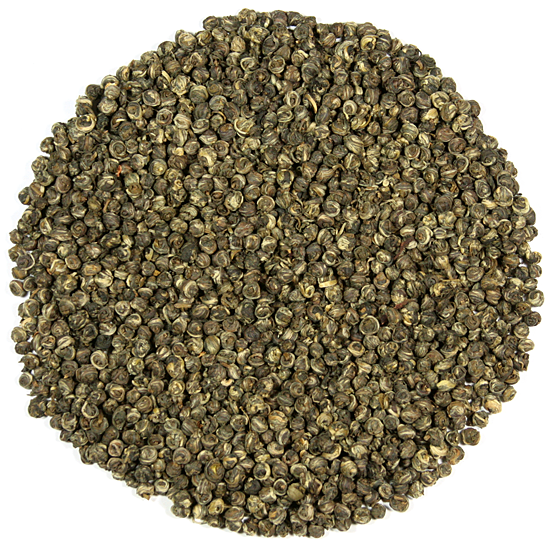 Our Jasmine Dragon Pearls are made with a mid-Spring pluck of tea leaf that is young enough to still be tender but large enough to be hand-rolled into the shape of a pearl. After careful primary drying the leaf (referred to as: zao pei at this stage of production) is held in controlled storage until the jasmine flower-buds are ready to bloom later in the season. When the jasmine plants are ready to bloom, Tea Trekker’s Dragon Pearls are scented. 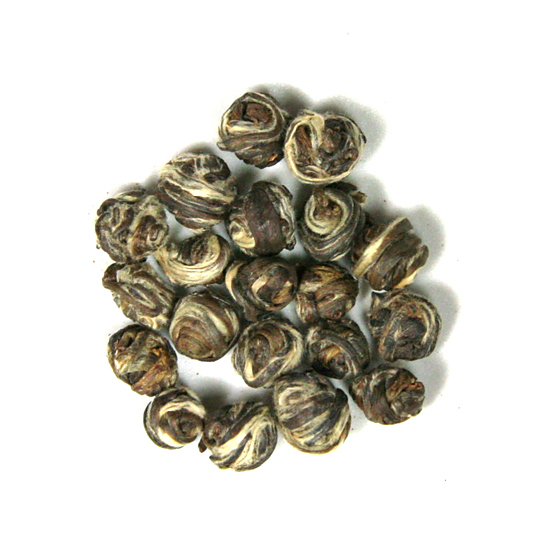 Our Jasmine Pearls are unique to us, no other tea merchant sells the Dragon Pearls that we do. We purchase an entire batch for our Jasmine tea loving customers. Tea Trekker’s Jasmine Dragon Pearls are classic in the Chinese tradition: medium-strong scenting with a delightful base tea flavor. 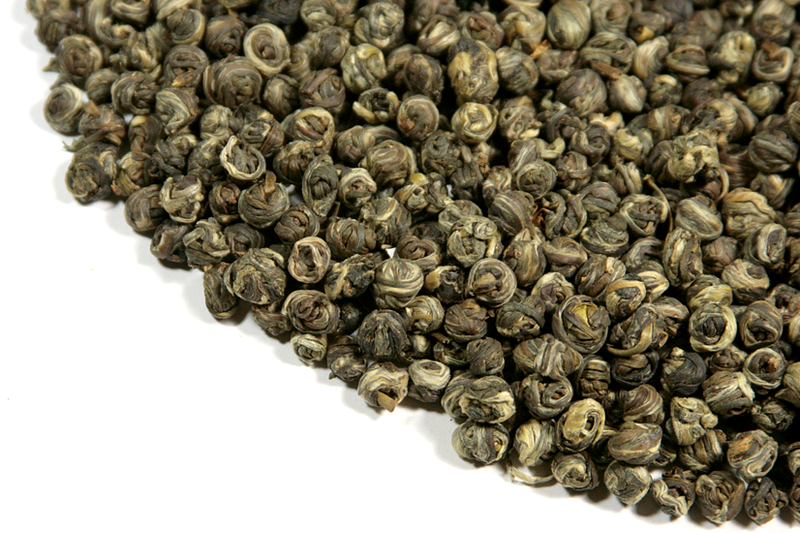 We know that our Dragon Pearls are excellent and expect that you will love them too! After the scenting process the pearls are carefully dried for storage and shipped to us. Traditional Jasmine tea ( Jasmine tea that is scented using fresh flowers and not artificial perfumes ) is made from fresh tea leaf that is picked and semi-processed in the spring, and then put into storage until the jasmine flowers bloom over the summer beginning in early July. Tea Trekker tends to prefer the varieties of jasmine that bloom a little later in the season, as they have a purity of scent and are rich and smooth. When the fresh flower buds arrive in the tea factory, the semi-processed tea is taken out of storage and ‘married’ together with the fresh still-closed buds. As the blossoms open in the evening the scenting process begins. Depending on the quality (and selling price) of the jasmine tea being made, the scenting process can take 24 hours or up to several weeks during which time the same batch of leaf is repeatedly introduced to fresh batches of jasmine flowers. The semi-processed leaf for Jasmine tea is a unique tea base made for the production of Jasmine tea. It must be perfect in style and level of minimal oxidation. Because jasmine tea production exposes the leaf to some heat during the processing, the leaf used for it is neither green, white, nor oolong tea, but a partially-finished leaf that is unique to jasmine tea processing, known as zao pei.